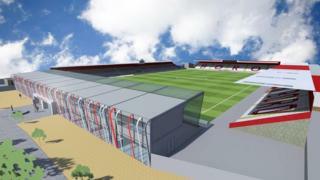 Stevenage Football Club is planning to build a new 1,700 capacity stand to replace the existing North Terrace. The League One side said the £1.2m stand would increase the capacity at The Lamex Stadium by about 1,000 people, to just over 8,000. Chairman Phil Wallace said: "The partly uncovered existing north stand hasn't been touched for decades and is way overdue for replacement." Plans will be submitted to the borough council in the "next few months". Mr Wallace said the current stand was "not acceptable to fans at this level of football" and the improvements would highlight the club's ambition of reaching the Championship. The Hertfordshire team were promoted to the Football League in 2010 and gained promotion to League One the following year. Mr Wallace said: "We've come a long way in the 12 years I've been here and we can't stop now."